Midwest Medical Transport partnered with our Omaha web design team for a website design and website content update. After many years with the a website that was outdated in design and information, Midwest Medical Transport knew a new website was just what its needed to refresh its brand. After all, in a field where the latest and best technology is crucial to response time and efficiency, its important that it show its commitment to this in its own marketing materials. After undergoing internal changes, Midwest Medical Transport wanted to feature its divisions of air and group transportation. With many different services and a lot of content, our team worked to organize the website for a good user experience. 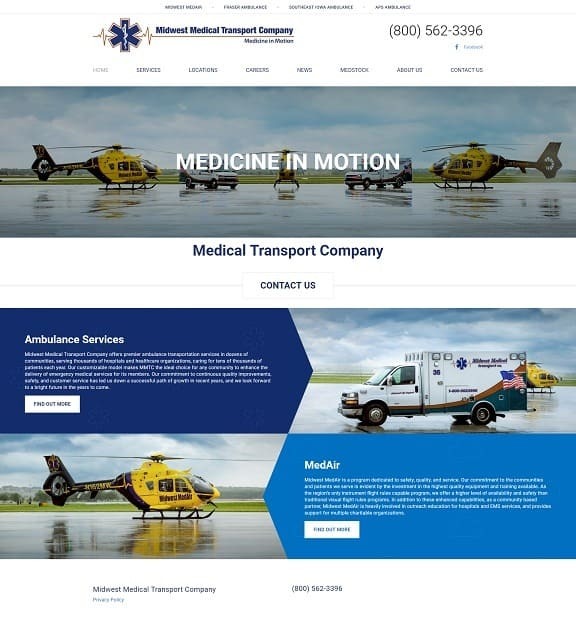 And, built on a WordPress Content Management System, Midwest Medical Transport will be able to update its own website as it expands services and technology – an important feature for a business that’s constantly evolving.